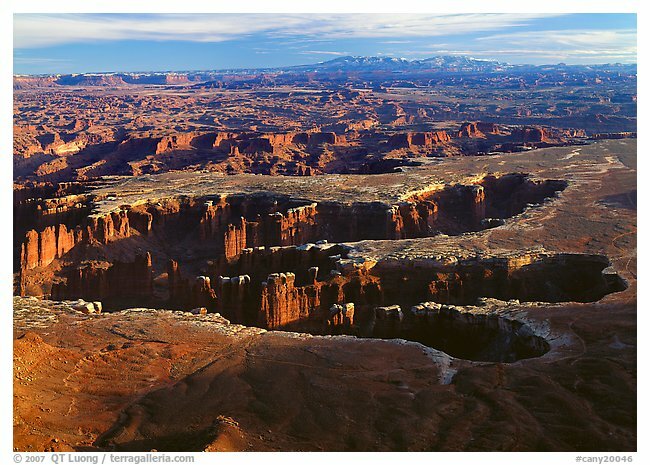 Canyonlands National Park is a wilderness of rock rivaling the Grand Canyon in richness and complexity. What makes the park special is the opportunity to view its red canyons from above and then travel into them relatively easily, experiencing the profound silence of some of the most remote terrain in the lower 48 states. The park is divided by the Colorado and Green Rivers into three distinct districts: Island in the Sky, the Needles, and the Maze. The detached Horseshoe Canyon is near the Maze. Isolated from one another, each section is accessed by a dead-end road, the distances between which are quite vast—camping in Island in the Sky or the Needles, rather than staying in nearby Moab or Monticello, will save a lot of driving time. 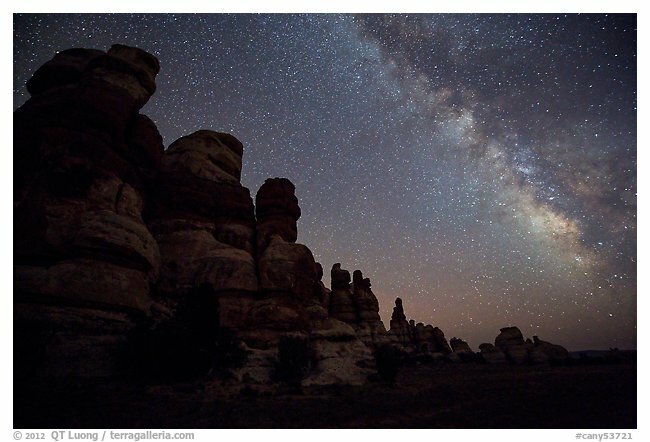 The only great views situated near paved roads are found in Island in the Sky, which also has its share of primitive roads, most notably the 100-mile White Rim Road. To see what the Needles District has to offer, you need to hike at least a few miles or drive difficult four-wheel-drive roads. The most primitive district is the Maze, with its legendary isolation and difficulty of access, most visits become an expedition requiring specially equipped vehicles, driving skills, and careful planning. 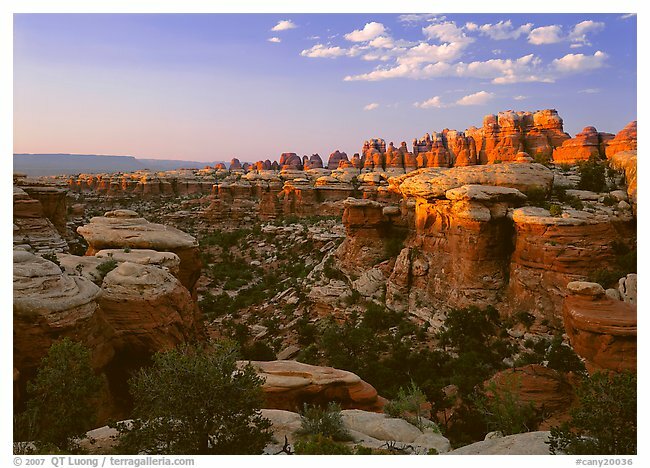 Like nearby Arches National Park, Canyonlands contains a lot of cryptobiotic soil, which is living groundcover that takes hundreds of years to grow and needs to be protected from trampling. Spring and fall are the most comfortable seasons for visiting the areas that involve hiking, as winters are very cold and summers very hot. Since little hiking is involved, a summer visit to Island in the Sky could be productive as thunderstorms bring dramatic skies in the afternoon. In late fall and early spring, the snowcapped La Sal Mountains provide a dramatic contrast to the canyons. 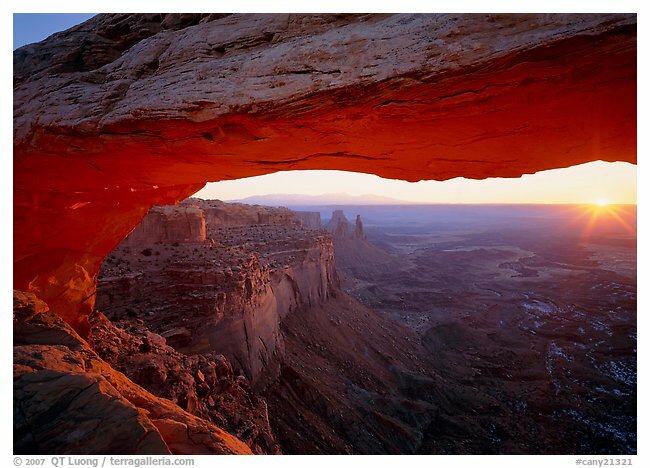 Mesa Arch is only about 50 feet wide and 10 feet high, but it is remarkable for two reasons. First, because of its position right on the edge of the mesa next to a drop of almost 1,000 feet straight down, it frames a vast expanse of canyons. Second, for 15 minutes after sunrise, light reflects from the wall below onto the underside of the arch, making it glow with a magical, intense red light that can only be seen at this spot at this time of day. 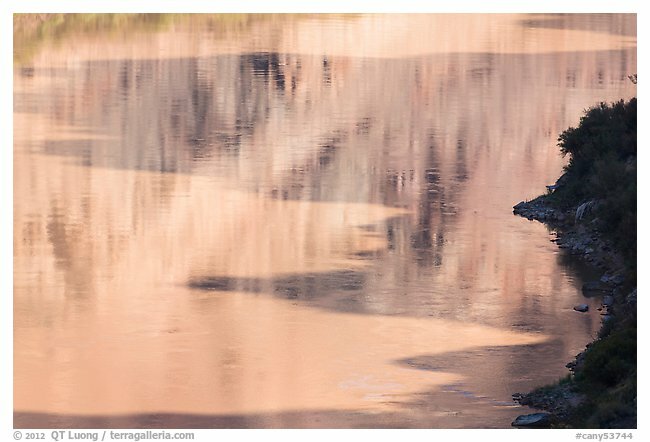 Reflected light is the key to many of the great photographs of the Colorado Plateau. Almost always enhancing the subject, reflected light is soft and directional at the same time, which is why reflectors of various sizes are used in sophisticated lighting setups. Moreover, the reflected light from the sandstone is much warmer than direct light, so when it reaches another patch of sandstone, it will cause it to glow with surreal, warm colors. The trailhead is about 5 miles south of the Island in the Sky visitor center, which is about 1 hour from Moab. From there, take the trail to the left and walk for about 15 minutes. When I visited in November of 1996, I had the place to myself, but since then, this iconic subject has become very popular, so I would advise coming early. If you prefer not to be shoulder-to-shoulder with other photographers, try a moonrise instead of a sunrise (which will result in the same glow), or try coming in the middle of winter. In order to get as much of the canyons in your view as possible, as well as the underside of the arch from the opening, it helps to position yourself close and use an extremely wide-angle lens. For reference, my image was photographed with the equivalent of a 24mm lens. Maze of interlocked canyons from Grand view point, Island in the sky. Canyonlands National Park, Utah, USA. The aptly named Island in the Sky is a high mesa with easily accessed overlooks offering extensive views of the surrounding canyons. Contemplating them from the edge of a high plateau, I began to make more sense of the overwhelming tangled expanse of rock as I scanned the vast distance to trace the outlines of the various canyons that make up the landscape. The panoramic view from Grand View Point at the end of the Island of the Sky Road is enhanced by the white-capped spires of Monument Basin directly below. If you hike the flat 2-mile round-trip Grand View Point Trail, you will be rewarded continuously with outstanding views of the district. In the late afternoon, the side light helped define the structures of the landscape, and it is also the angle where the polarizing filter is most effective. Junction Butte casts a shadow across Monument Basin late in the afternoon, so unless there is a sky with high clouds likely to produce a colorful sunset, I prefer to catch the setting sun at the Green River Overlook, which is especially beautiful under storm clouds. Directly west (to the right) of the overlook, I found gnarled and twisted junipers that make interesting foregrounds. Dead Horse Point State Part is not part of Canyonlands National Park, but from its southern tip (Dead Horse Point Overlook), you can enjoy a fantastic view of the Colorado River’s impressive bend, a sight that is not available from any of the Island in the Sky overlooks. The location is good both at sunrise and sunset. A kiva refers to a circular structure built by Pueblo Indians for ceremonial purposes. The one found in Canyonlands National Park is called “False Kiva” because excavation has shown that the structure was used for daily activities rather than rituals. Upon arriving at the extraordinary setting inside an isolated alcove hidden in a cliff, I was immediately overwhelmed by site’s spiritual atmosphere. The improbable and adventurous trail leading to the location adds to the mystique. I made sure to respect the site by not stepping inside the structure and by walking out of the alcove to eat a snack. The location of this site is not publicized nor marked on maps (per the National Park System requirements for class 2 sites), but rangers at the Island in the Sky visitor center will provide you with precise directions. The hiking distance is about 3 miles round-trip from the Alcove Spring trailhead (near Upheaval Dome), where you park your car. From there, cross the road and hike south along the road for about 1,000 feet until you reach a bend in the road lined with juniper logs, which is where the primitive but well-worn trail starts. In 2012, I found it well cairned and not too rough. The light is most balanced in the late afternoon. Sunset also works, although the kiva is a bit dark. 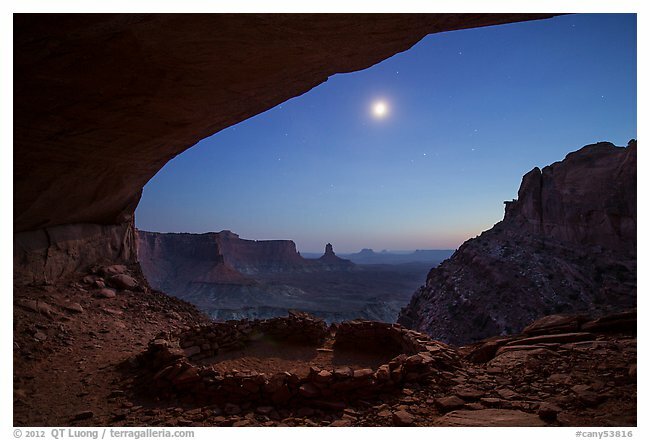 I made the photograph about one hour after sunset when the moon was bright enough to light the kiva, but there was still a bit of residual daylight to brighten the whole scene. False Kiva is a great location for night photography: I stayed there until 2:45 AM. The Needles District is named after the colorful stone spires that dominate the landscape. Unlike the distant panoramic vistas that distinguish Island in the Sky, the Needles offer a more immersive experience in the landscape, through hikes rather than roadside sweeping views. The most interesting short trail is at Pothole Point, which has little depressions in the rock that fill up with water after a rain, becoming tiny reflective pools. To get closer to the Needles, which are quite distant from the main road, you need either to drive extremely difficult four-wheel-drive roads or to hike some distance. As an introduction to the area, I recommend the Chesler Park Trail (6 miles round-trip), which starts from the Elephant Hill trailhead. This primitive trail, marked with cairns, traverses a great variety of terrain: over ridges, through narrow slots, and between rock towers. About midway on the trail, you’ll find my favorite view of the Needles: just before dropping into the Elephant Canyon slot, wander a bit north and you will find views that are equally good at sunset (looking north) and sunrise (looking south). I made the photograph right when the last light of the day touched the Needles. At that time, the contrast was low enough that Elephant Canyon didn’t appear too dark. Chesler Park is a grassy basin that provides nice horizontal contrast with its surrounding tall pillars. Sunrise and sunset light would be great there, but hiking in the dark on the primitive trail would require attention. 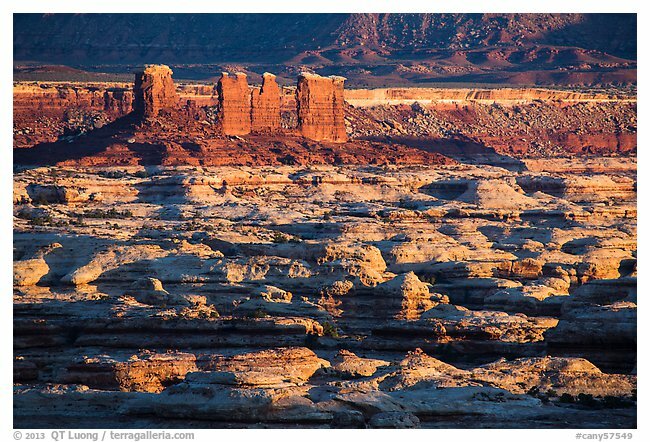 The Maze District is the wildest and most rugged of the three districts in Canyonlands National Park. Traveled only by 3 percent of visitors to the Park, it is one of the most remote backcountry destinations in the contiguous United States. It is rare to find yourself at a location with a spectacular view in all directions, and even rarer when that location has been photographed only by a few. Pete’s Mesa is one such location. During a photo tour that I led, all the participants made it there for sunrise, after hiking 4 miles in the dark from the Chimney Rock trailhead. With the appropriate high-clearance four-wheel-drive vehicle (stock SUVs may not be enough for most drivers), you can drive the 37 miles from the Hans Flat Ranger Station to the mesa in about 5 hours, which should give you a good idea of the road difficulty. After photographing at sunrise, we hiked down to the bottom of the Maze via the Pictograph Fork— designated as the most dangerous hike in North America by Backpacker magazine—where we saw lovely interlocking canyons that very few ever visit. The difficulty with this hike lies in its remoteness and the number of side canyons, which all look alike and could contribute to getting lost, rather than from the terrain. Midway on our 12-mile loop, we stopped for lunch at the base of the Harvest Scene, a panel of life-size pictographs painted over 3,000 years ago by nomadic groups of hunter-gatherers, in the Barrier Canyon style identical to the Great Gallery in Horseshoe Canyon. The Harvest Scene can be reached via a much shorter trail from the Maze Overlook, although it involves climbing on steps carved in steep sections of rock. If you don’t want to risk getting lost hiking, you can see the maze of canyons from road-accessible viewpoints near the Maze Overlook campsite (best at sunset) and the Standing Rocks campsite (best at sunrise). For the photograph, I just rolled out of the tent and walked a minute to the rim. Situated at the end of the road, the Doll House is the most remote vehicle-accessible location in the park, requiring 9 hours of driving from Moab, although it is only 35 miles as the crow flies. I mention it separately from the Maze because there is a little-known shortcut. Instead of driving a bumpy road all day, for my first visit there, I accessed the Doll House from the river. The boat dropped me off at Spanish Bottom, shortly after the confluence. The well-established trail to the Doll House is only slightly more than a mile, but there is a 1,000-foot elevation gain from the river, leading into a magnificently silent and isolated landscape of whimsical, brightly colored spires encircling a meadow-like flat that reminded me of Chesler Park. Sunset light was the best, but sunrise worked, too. In between, because of the remoteness of the area, the skies were very dark, perfect for photographing the stars. To capture the diagonal of the Milky Way mirroring the line of the pinnacles, I used my widest lens at 14mm f/2.8, and exposed for 30 seconds at ISO 6400. In the morning, before going back to Spanish Bottom, I hiked a short loop that led to fantastic views of Surprise Valley and an ancient granary built by Ancestral Puebloans. One of the advantages of hiking into the Doll House is that you do not need a reserved campsite, unlike car-campers. There are only three campsites at the Doll House (they are equally scarce in the rest of the Maze District), but they are far enough from each other that you can appreciate the extraordinary silence of the Maze. 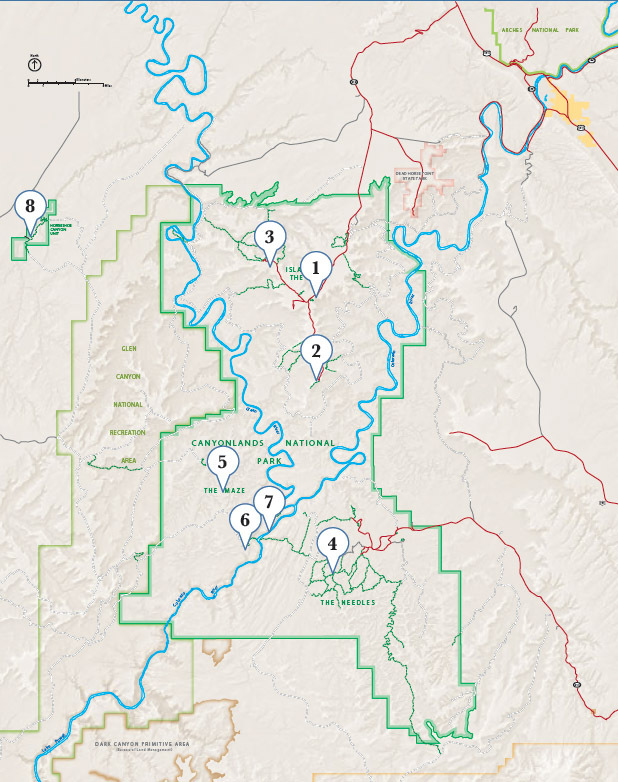 The Colorado and the Green River have shaped the Canyonlands and mark the borders of its districts, The National Park Service considers the rivers to form a district of their own, separate from the other three districts. All river viewpoints are quite lengthy hikes on foot. However, the rivers are easily accessed from outside the park. Navigating them offers you a new perspective from the bottom. Above their confluence, both rivers are placid, but below the confluence, they form rapids, which are as powerful as those in the Grand Canyon. Outfitters operate shuttle boats that can carry small watercraft, so you don’t have to paddle back upstream. Even if not paddling, you can utilize the boats for either an all-day trip or for a camping drop-off that provides access to the heart of the park. The ride on the Colorado River from Potash to the confluence with the Green River takes about 2.5 hours. Besides the unusual river-level views, the ride is quite thrilling, as the jet-propelled specialty boat speeds over 30 mph on calm waters. Horseshoe Canyon is a detached unit of Canyonlands National Park that protects the Great Gallery, considered by some to be the best rock art panel anywhere. 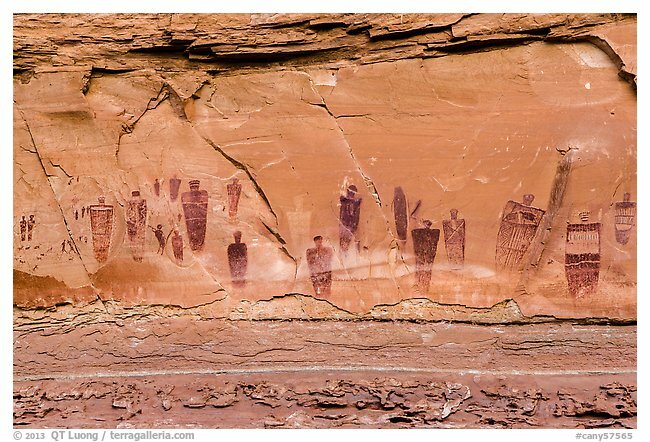 The intricate life-size figures were painted by the Archaic People who lived in Utah from 8,000 to 2,000 years ago, predating the Ancestral Puebloans. Of the two trails in Horseshoe Canyon, the main trail, starting from the west rim, is a gradual 7 miles round-trip. In good road conditions (be sure to inquire at the visitor center), regular vehicles can get to the trailhead. 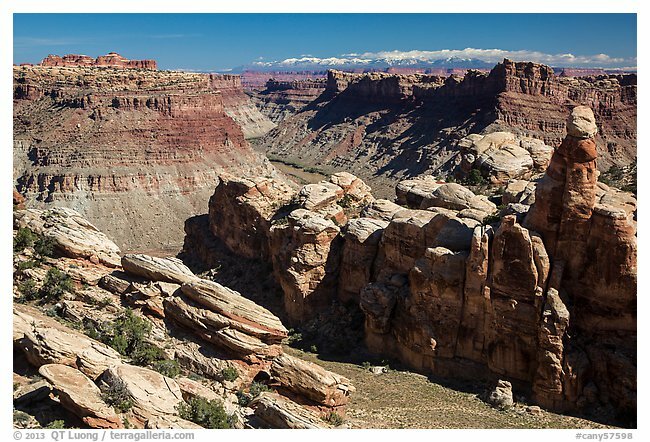 We hiked the seldom-used Deadman’s Trail from the eastern rim because it is only 3 miles round-trip, descending almost straight to the Great Gallery. However, it is much steeper and requires a high-clearance four-wheel-drive to get to the trailhead. As the Great Gallery faces southeast, the best light might be moments before early morning sun strikes the wall, when it glows with reflected light. The shade of the afternoon reduces glare compared to the direct morning sun. Note that you should never touch rock art, since the natural oils from your skin may damage it. In addition to the rock art, Horseshoe is a lovely canyon lined with many cottonwood trees that turn yellow in late October, a relatively rare sight in the park.